Phase two of a multimillion-dollar cybersecurity training center taking shape downtown is expected to be completed by the end of next year. Georgia Gov. Nathan Deal announced Monday an additional $35 million in funding for the Hull McKnight Georgia Cyber Innovation and Training Center. The second facility will be an incubator hub for technology startups and a training space for state cybersecurity initiatives and workforce development programs. “We’re excited about this,” said Calvin Rhodes, the state’s chief information officer and the executive director of the Georgia Technology Authority. “This is just huge for the state.” Rhodes said the five-floor structure “will almost mirror the original building,” except both phases will share the center’s 320-seat auditorium. Phase two will cover 165,000 square feet, and construction is scheduled to begin immediately. Phase one, being built now, is 167,000 square feet. Phase two is expected to open in December 2018. Phase one is on track to open July 10 . The phase will sit on either side of a U-shape drive on the center’s campus. Phase one is being built now on the east side of the drive. Although Rhodes said there are no immediate plans for a third phase of the center, he pointed out how phase two signifies that “there’s a vision that the need for cybersecurity is going to grow” and that there’s a need in Augusta to support that. 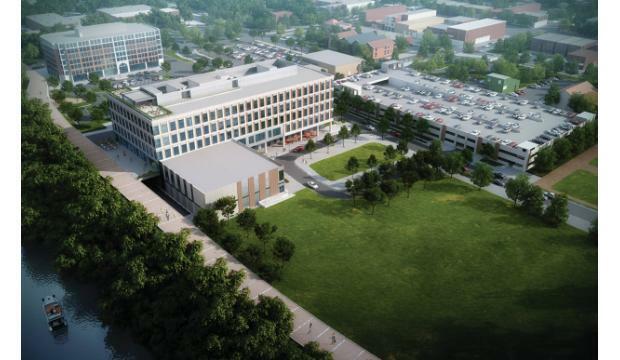 Phase two will provide workspace “allowing technology companies to establish fellowships, internships and co-op program opportunities for students and employees,” according to the governor’s Office of Communications. It also will be a training facility for information security professionals employed by state and local governments. The center is aligned with Augusta University’s Cyber Institute and AU’s recently launched School of Computer and Cyber Sciences. The center will anchor AU’s Riverfront Campus.